Qiu Xiaolong will soon be in Paris to present his novel, a book which like the previous is first published in France, a tribute to his readers but also to the efficiency of his publisher Liana Levi and her team. He will attend the Book Fair on March 21 but, of course, not as a member of the Shanghai delegation, the city which is the guest of honor of the show. He was born in Shanghai, but now an American citizen, he lives in St. Louis where he is a professor, poet, novelist, author of crime stories but also of outstanding short stories ( “City of the red dust “). He is removed from office with a brilliant promotion, without any power. But above all, people seek to neutralize and discredit him. He does not understand who wants to kill him. To protect himself, he leaves for Suzhou, one hour away from Shanghai, to perform some improvements on the tomb of his father. He can only rely on very close friends whom we have known for a long time. He also exchanges information with Qian, a passionate with Suzhou opera and the mistress of an important official..
Chen Cao will realize that the character in the center is a British businessman, close to Lai, the party secretary of Shanghai and especially to Kai, his wife. Lai / Bo Xilai, is a red prince, his father Bo Yibo was a close associate of Mao before being dismissed during the Cultural Revolution. Party chief in Chongqing, a city of around 30 million inhabitants, Bo Xilai developed an operation against organized crime, 5,000 people were arrested, not always rightly , and their property confiscated. It became also appropriate to sing “red” songs, songs of the Maoist period. This populist policy was meant to promote Bo Xilai up to the top of the state before his fall that followed that of his wife Gu Kailai. Rue89 told you repeatedly about this case. Qiu Xiaolong is sensitive because he remembers his harassed family during the Cultural Revolution and the fact that ” for the younger generation (it is) as a mythology which fell into oblivion. In textbooks, there is no mention anywhere of the atrocities committed under Mao government”. Many episodes of the novel and some characters refer to a succession of cases of corruption during the past three years. One of the most spectacular: five thousand dead pigs floating on the Hangpou river which flows through Shanghai. In the past, dead pigs finished as sausages. The scandal of rotted sausages pushed farmers and merchants to throw the dead pigs into the river rather than to bury them ! As in his previous novel ” Cyber China “, our author emphasizes the critical role of the Internet. It is a hacker whom he has assisted, who will ultimately allow him to save his head. He also shows that social networks are extremely efficient vehicles for denunciation of corruption. It is in the garden of the Lion Forest, one of the wonderful gardens classified as World Heritage by UNESCO, that a young lady will bring to Chen decisive elements. Food is also an essential heritage and descriptions by Chen of colors, smells, textures of the Suzhou kitchen are irresistible and mouth watering. Suzhou is also the city of the Kunqu opera, born in the 14th century and which almost disappeared during the Cultural Revolution. It is still existing in theaters of a few Chinese cities and plays like “The Peony Pavilion” are unforgettable. 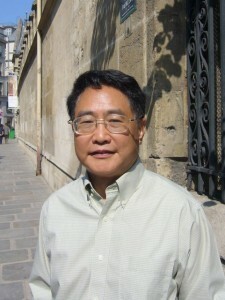 Qiu Xiaolong is also a poet and he uses his books to introduce Chinese poetry and his own poems . Many poems are listed but I cannot resist the pleasure to quote his favorite poet, Li Shangyin ( 813-858 ), translated by Qiu Xiaolong. only when it is burned down to ashes. reading alone in the night. and take a look for me”. 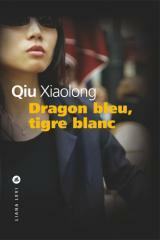 Qiu Xiaolong , ” Blue Dragon, White Tiger “, translated into French by Adelaide Pralon . Editions Liana Levi , March 2014 , 304 pages , 19 euros.